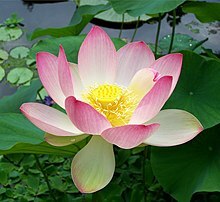 ↑ "Long-living lotus: Germination and soil -irradiation of centuries-old fruits, and cultivation, growth, and phenotypic abnormalities of offspring" (2002). American Journal of Botany 89 (2): 236–47. doi:10.3732/ajb.89.2.236. PMID 21669732. ↑ Perry, F. (1972) Flowers of the World. Bonanza Books, pp. 192–193. ISBN 060001634X.